I’m in, finally, for the first time. A long time ago I’ve tried to participate but due to time constraints I never finished the game. The next few Ludum Dares were always on a bad date, but surprisingly this weekend it looks like that I’ve the whole weekend for myself! CLion – First time actually using it! So I realized that I haven’t spent the proper amount of time actually preparing for this LD compo, which means that I’m going to be doing a bit of coding right up until the compo itself starts. Though I guess that since I’m planning on doing as much of the game as possible through scripts the whole separation is a moot point. Either way, you’re welcome to see the code skeleton as it fleshes out to something that can actually be used. Going to tag, branch, and try to keep the game code split from the rest. Maybe the framework will end up as something other people might be able to use after all. Feel free to watch the progress at https://github.com/ace13/LD31 and I wouldn’t mind hearing any suggestions you might have for useful things to include into such a framework. And feel free to throw issues at me if you find things that are just plain wrong in the code, constructive criticism is always welcome. Happy coding to you, and I hope you’re better prepared than me for what’s coming. The aim of the game is to travel through and place portals which will flip the player to the other side of the map in order to collect portal potions to create portals and keys to unlock doors, to complete the level’s end which is marked by a red flag. Tags: 3D, awesome, C++, cool, flipside, opengl, sfml, trippy, why are you reading this? I need to improve the graphics, make levels, and other stuff now. I’m in for my first LD ! This will be my first LD. Don’t know if I will have the time to complete a game, but I’ll do my best. Libraries : SFML + Ponypy (a little “homemade” toolkit that I wrote, I’ll upload the sources). Oh, and I will be streaming. Maybe. So, almost a day into the compo and I’ve gotten myself done with the basic game looks. Going rather well I’d say then. 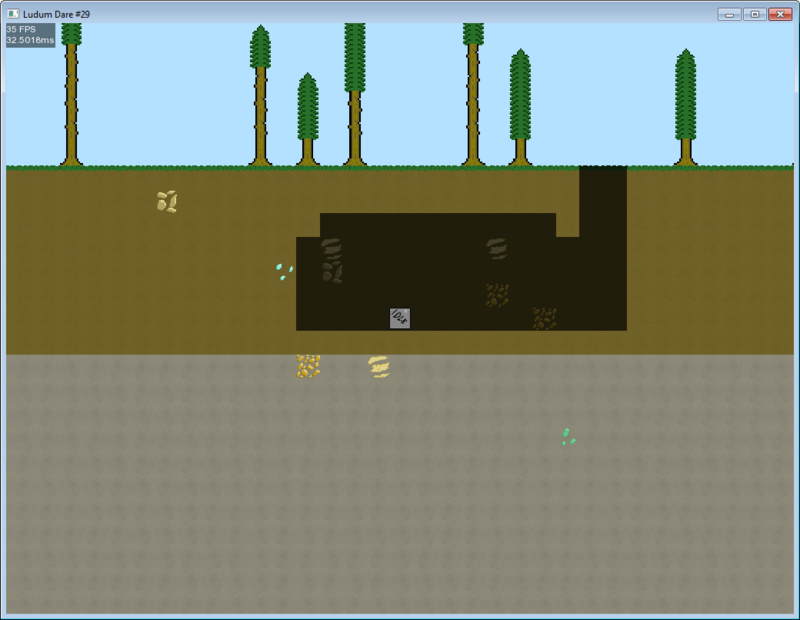 I’ve still got to add proper physics, proper digging, resource management, buildings, etc, etc, etc. But it’s still going rather well I’d say. Plus, I’ve somehow managed to actually make the game look okay, which I’m the most surprised about. I was expecting it to look horrible at this point, and all it does is look unpolished. You can watch me creating it on my twitch page, though I’ll be breaking for some food right after this post. Look back in an hour and I’ll be back, hard at work again. This will be my second LD, and this year I’m taking a somewhat risky approach. I’ve been putting together a little entity/component/system in C++ over the last couple months, and threw a teensy little game engine on top of it with SFML. We’ll see how well it holds up 😛 (and if it doesn’t, I’ll get some work done on my engine :D). I’ll be working on throwing a few niceties into the engine in the next couple hours, in a last minute excuse for preparation. My engine code is hosted on GitHub: https://github.com/stett/frame. OK – time to run to the store to make some regrettable dietary decisions. Well, now that I’m back on the internet again after my short vacation and gradma visit I’ll be making my entry statement to the compo. Hopefully I’ll have time once I get home (on a train at the moment) to start working on a base framework, so I don’t have to spend the first hours doing that. The code will, as always, be on my GitHub. And I’ll be streaming the entire process on my Twitch account. I’m going to make an effort to try and answer any viewer questions that might arise, since I haven’t been very good at that the last few times. I guess all that’s left to say is; Good luck to all the rest of you nice people, and let’s aim for a nice theme.